Finally, the Forex trading method you have been long waiting is here. This will be offered to you not as a system, but as a trading service, called RPTS - Reaction Point Trading Service. The delay was due to the extensive testing and usage of the system and proving to ourselves that it's rock solid and adequate to be offered to Let's Talk Winning customers. The method has been developed by a European colleague of mine and his expertise on this field is outstanding. 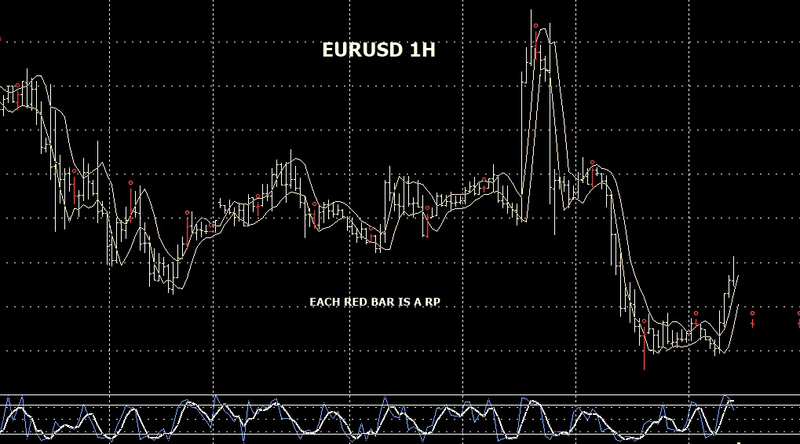 It's a unique new method to determine accurate intraday time reaction points and extensively tested on various markets, especially on Forex. Thus, we're offering to you a new and unique weekly service of intraday reaction points (RP). Because TP's (time points) are known in advance, traders have all the time to prepare their trades. Therefore there is also no need to sit down and watch the graphs all day, no stress, no mental fatigue. The trader will only access the monitor at the indicated times to be ready to trade. This service only supplies the TP's without further instructions on how to use them in any trade. It is assumed that a trader has sufficient basic knowledge to carry out trades. All that is needed is basic knowledge of technical trading on graphs. For example, it suffices to combine the TP's with a simple SSO (slow stochastic oscillator). The combination of SSO and TP's provides sufficiently accurate information to decide whether to buy or sell. These RP's are given before the start of the week: each Sunday subscribers receive the points for the coming week starting on Monday. You can expect on average between 1 and 3 points per day. That means between 5 and 15 signals in one trading week. All these points are given beforehand, as explained above. They are best used on an hourly graph. TP's (Time Points) are universal: they are valid for all markets, i.e. forex, indices, individual stocks and commodities, etc. When the announced time comes near, the graphs are opened and those that are also confirmed by the technical analysis will be taken and acted on. This is very important to remember: a trade is only initiated when the RP is confirmed by technical analysis (TA). Each trader has his own approach for this and is free to decide whatever confirmation signals will be considered as usual for that trader. As these reaction points are meant for users that already are trading, TA methods can be different from person to person. Traders could keep applying their standard technical signals but only when there is a RP. The choice of indicators can be complex or very simple. Something that works fine with the RP's, is a combination of a simple moving average of 21 periods (not critical) SMA with a stochastic oscillator of 5,3,2 (also not critical) SO. This very simple technical setting combined with a RP results in a very powerful total trading signal with an high chance of getting a profitable trade. When to get out of a trade is then entirely up to the trader to decide, based on his or her used method. RPTS is also the ideal approach to binary betting: in that case there is even no need to decide when to get out and that would make life for a trader very easy. Always use a sound money management system together with RPTS and never put all your eggs in one basket. But that is something each trader should already be doing. The trader can convince him/herself of the power of this method without an risk and free of charge. It is sufficient to request a trial subscription, so that you receive the daily TP's for the period of two weeks. Even if you become a paying member after this trial period, you can cancel any time if you are not satisfied against all odds. In view of the unseen accuracy and power of these TP's one will gladly remain enrolled in this very lucrative subscription. The subscription consists of US$100 per 4 weeks, paid with your preferred method, credit card by the secure purchase order form or PayPal to my id: izak.matatya@videotron.ca, after your two weeks' trial period. After your two weeks free trial, you can notify me if you wish to subscribe and provide your credit card information or send $100 PayPal payment. Your credit card will be charged $100 every 4 weeks until you decide to unsubscribe by giving me a notice by email to: izak.matatya@videotron.ca. You can also ask for being charged every 4 weeks with no automatic renewal or subscribe for any 4 weeks beginning at your convenience. A reminder will then be emailed to you. Then if you wish to cancel your subscription, you simply stop sending the $100 monthly subscription fee. You cannot ask for a full or partial refund. The service will be provided to you for the four weeks following your payment. If you wish to resubscribe you're welcome to do so any time by issuing the four week service fee of $100. The $100 subscription fee includes 4 weeks' of TP's. In case, for any reason, we are not able to provide TP's for one week, the subscription will be extended to receive the full four weeks in total. The TP's provided to you will be used by ourselves and stats will be provided to you for the previously traded week when you receive the TP's for the following week. Out of those 35 placed trades, 25 resulted in profit, meaning that we have a 25/35 = 71.42% advantage, which gives us a strong edge. Email me at: izak.matatya@videotron.ca when you wish to start your free two-week trial. You can already start receiving the TP's as of this coming Sunday. Your $100 payment anytime will indicate your wish to receive the next four weeks' trades given to you, starting the Sunday following your subscription date, again with your preferred method, credit card by the secure purchase order form or PayPal to my id: izak.matatya@videotron.ca. Please make sure to specify in your email if you wish automatic renewal every 4 weeks or not.